We were approached by Mr P’s daughter for help with making improvements to his home that would allow him to retain his independence, and remain living in his home rather than a care home. Whilst he wished to avoid the move to a care home, he was aware it may have to happen in the future if his mobility declined significantly. In his 90’s, Mr P suffered with various debilitating ailments and found his bath tub very difficult to use. To help make bathing easier, he wanted it replaced with a new easy access walk in shower. Part of our design brief was for the new shower to be easily converted into a standard shower to make the property easier to sell in the event of a move to a care home. The current bathroom and WC were divided into two rooms by a stud wall. The intention was to remove the stud wall and make a larger bathroom with the shower and WC in one room. This change made manoeuvring in the bathroom easier and granted access to all of the bathroom facilities in one room rather than two. With these requirements in mind we proposed taking down the wall and making the shower enclosure simple enough to convert into a standard shower, in the event of a future house sale. Our design included a stylish full height shower screen made of toughened glass, as well as a wall fixed shower seat and grab rails within the shower area. 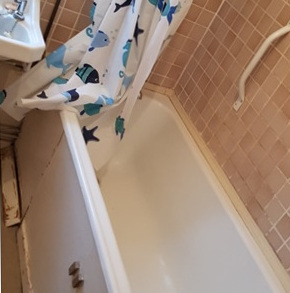 The shower seat and grab rails could be easily removed and the fixings holes could be filled, which though not ideal, would be sufficient to tidy up the shower for the purposes of a sale. Our proposal was accepted and an order placed. As you can see from the images taken throughout the renovation work, removing the stud wall achieved the desired effect of making the bathroom bigger and the windows now allowed more light to enter the room. With the old bath tub, basin and WC removed we were able to install the new shower, basin and WC. We used waterproof cladding within the shower area and the space extending just out of the shower area. Cladding is a popular choice as it looks good and is easy to keep clean. A down pipe next to the WC was encased in box work, the old WC doorway blocked up and the walls on the WC and basin side of the room were painted. Anti slip flooring was laid to finish the room. The finished work achieved Mr P’s requirements for an easy to access shower and a larger bathroom, that could be easily converted back to a standard looking bathroom. 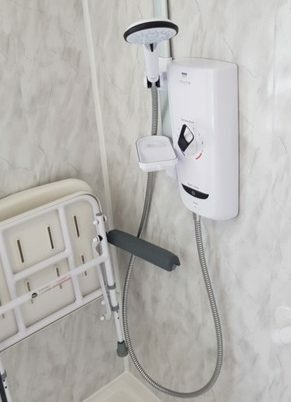 If the above sounds similar to the situation you or a loved one are in, and you would like to adapt the bathroom so it is easier for a person with reduced mobility to use, whilst retaining good presentation and reverse adaptability, please get in touch with Absolute Mobility. Need some help choosing your new easy access bathroom? Absolute Mobility are a professional and friendly team who specialise in accessible bathrooms for all. We offer supply and fitting of mobility bathroom solutions, backed by Checkatrade.com ratings and a price match guarantee. Please note, product designs change from time to time and the actual product may differ from the one illustrated.